So the Fed decided not to raise rates this weeks. And as you’ve probably seen, this provoked an angry response from representatives of financial institutions. The owners and managers of money have been demanding higher interest rates for years now, and were clearly hoping that this week they’d finally start getting them. I’ve tried to understand demands that rates go up despite the absence of inflation pressure in terms of broad class interests. And the trouble is that it’s not at all clear where these interests lie. The wealthy get a lot of interest income, which means that they are hurt by low rates; but they also own a lot of assets, whose prices go up when monetary policy is easy. You can try to figure out the net effect, but what matters for the politics is perception, and that’s surely murky. What we should be doing … is focusing not on broad classes but on very specific business interests. … Commercial bankers really dislike a very low interest rate environment, because it’s hard for them to make profits: there’s a lower bound on the interest rates they can offer, and if lending rates are low that compresses their spread. So bankers keep demanding higher rates, and inventing stories about why that would make sense despite low inflation. I certainly agree with Krugman that in thinking about the politics of monetary policy, we should pay attention to the narrow sectoral interests of the banks as well as the broader interests of the owning class. But I’m not sure this particular story makes sense. What he’s suggesting is that the interest rate on bank lending is more strongly affected by monetary policy than is the interest rate on bank liabilities, so that bank spreads are systematically wider at high rates than at low ones. This story might have made sense in the 1950s and 1960s, when bank liabilities consisted mostly of transactions deposits that paid no interest. But today, non-interest bearing deposits compose less than a quarter of commercial bank liabilities. Meanwhile, bank liabilities are much shorter-term than their assets (that’s sort of what it means to be a bank) so the interest rates on their remaining liabilities tend to move more closely with the policy rate than the interest rates on their assets. So it’s not at all obvious that bank spreads should be narrower when rates are low; if anything, we might expect them to be wider. Luckily, this is a question we can address with data. Historically, have higher interest rates been associated with a wider spread for commercial banks, or a narrower one? Or have interest rate changes left bank spreads unchanged? To answer this, I looked at total interest income and total interest payments for commercial banks, both normalized by total assets. These are reported in a convenient form, along with lots of other data on commercial banks, in the FDIC’s Historical Statistics on Banking. The first figure here shows annual interest payments and interest costs for commercial banks on the vertical axis, and the Federal funds rate on the horizontal axis. It’s annual data, 1955 through 2014. The gap between the blue and red points is a measure of the profitability of bank loans that year. The blue and red lines are OLS regression lines. If Krugman’s theory were correct, the gap between the blue and red lines should be wider on the right, when interest rates are high, and narrower on the left, when they’re low. But in fact, the lines are almost exactly parallel. The gap between banks’ interest earnings and their funding costs is always close to 3 percent of assets, whether the overall level of rates is high or low. The theory that bank lending is systematically less profitable in a low-interest environment does not seem consistent with the historical evidence. So it’s not obvious why commercial banks should care about the overall level of interest rates one way or the other. Here’s another way of looking at the same thing. Now we have interest received by commercial banks on the vertical axis, and interest paid on the horizontal axis. Again, both are scaled by total bank assets. To keep it legible, I’ve limited it to the years 1985-2014; anyway the earlier years are probably less relevant for today’s banking system. The diagonal line shows the average spread between the lending rate and the funding rate for this period. So points above the line are years when bank loans are unusually profitable, and points below are years when loans are less profitable than usual. Here again, we see that there is no systematic relationship between the level of interest rates and the profitability of bank loans. Over the whole range of interest rates, spreads are clustered close to the diagonal. What we do see, though, is that the recent period of low interest rates has seen a steady narrowing of bank spreads. Since 2010, the average interest rate received by commercial banks has fallen by one full percentage point, while their average funding cost has fallen by a bit under half a point. On the face of it, this might seem to support Krugman’s theory. But I don’t think it’s actually telling us anything about the effects of low interest rates as such. Rather, it reflects the fact that bank borrowing is much shorter term than bank lending. So a sustained fall in interest rates will always first widen bank spreads, and then narrow them again as lending rates catch up with funding costs. And in fact, the recent decline in bank spreads has simply brought them back to where they were in 2007. (Or in 1967, for that matter.) No doubt there are still a few long-term loans from the high-rate period that have not been refinanced and are still sitting profitably on banks’ books; but after seven years of ZIRP there can’t be very many. There’s no reason to think that continued low rates will continue to narrow bank spreads, or that higher rates will improve them. On the contrary, an increase in rates would almost certainly reduce lending profits initially, since banks’ funding rates will rise more quickly than their lending rates. Now, on both substantive and statistical grounds, we might prefer to look at changes rather than levels. So the next two figures are the same as the previous ones, but using the year over year change rather than absolute level of interest rates. In the first graph, years with the blue above the red are years of widening spreads, while red above blue indicates narrowing spreads. In the second graph, the diagonal line indicates an equal change in bank lending and funding rates; points above the line are years of widening spreads, and points below the line are years of narrowing spreads. Again, I’ve limited it to 1985-2014. Both figures show that rising rates are associated with narrower commercial bank spreads — that is, less profitable loans, not more profitable. (Note the steeper slope of the red line than the blue one in Figure 3.) Again, this is not surprising — since banks borrow short and lend long, their average funding costs change more quickly than their average lending rates do. The most recent three tightening episodes were all associated with narrower spreads, not wider ones. Over 2004-2006, banks’ funding costs rose by 1.5 points while the average rate on their loans rose by only 1.3 points. In 1999-2000, funding costs rose by 0.55 points while loan rates rose by 0.45 points. And in 1994-1996, bank funding costs rose by 0.6 points while loan rates rose by 0.4 points. Conversely, during the period of falling rates in 2007-2008, bank funding costs fell by 1.7 points while average loan rates fell by only 1.4 points. Admittedly, these are all rather small changes — what is most striking about banking spreads is their stability. But the important thing is that past tightening episodes have consistently reduced the lending profits of commercial banks. Not increased them. Thinking about the political economy of support for higher rates, as Krugman is doing, is asking the right question. And the idea that the narrow interests of commercial banks could be important here, is reasonable on its face. But the idea that higher rates are associated with higher lending spreads, just doesn’t seem to be supported by the data. Unfortunately, I don’t have a simple alternative story. As the late Bob Fitch used to say, 90 percent of what happens in the world can be explained by vulgar Marxism. But banks’ support for hard money may fall in the other 10 percent. UPDATE: For what it’s worth, here are the results of regressions of average interest received by commercial banks and of and their average funding costs, on the Federal Funds rate. Both interest flows are normalized by total assets. Again, we don’t see any support for the hypothesis that spreads systematically rise with interest rates. Depending on the period and on whether you look at levels or changes, you can see a slightly stronger relationship of the Federal Funds rate with either bank lending rates of funding costs; but none of these differences would pass a standard significance test. Two positive conclusions come out of this. First, all the coefficients are substantially, and significantly, below 1. In other words, the policy rate is passed through far from completely to market rates, even in the interbank market, which should be most closely linked to it. Second, looking at the bottom half of the table, we see that changes in the policy rate have a stronger affect on both the funding and lending rates (at least over a horizon of a year) today than they did in the postwar decades. This is not surprising, given the facts that non-interest-bearing deposits provided most bnk funding in the earlier period, and that monetary policy then worked through more limits on the quantity of credit than interest rates per se. But it’s interesting to see it so clearly in the data. UPDATE 2: Krugman seems to be doubling down on the bank spreads theory. I hope he looks a bit at the historical data before committing too hard to this story. VERY LATE UPDATE: In the table above, the first set of rows is levels; the second is year-over-year changes. This measure is not quite the same as the spread — for that, we would want to divide bank interest costs by their liabilities, or their interest-bearing liabilities, rather than their assets. But this measure, rather than the spread in the strict sense, is what’s relevant for the question we’re interested in, the effect of rate changes on bank lending profits. Insofar as bank loans are funded with equity, lending will become more profitable as rates rise, even if the spread is unchanged. For this reason, I refer to banks average funding costs, rather than average borrowing costs. From my Roosevelt Institute colleagues Mike Konczal and Nell Abernathy, here’s a primer on “financialization“. This term is used widely but not always precisely; most definitions are some tautological variant of “more finance.” Mike and Nell wisely don’t try to provide a single analytical definition, but treat it as shorthand for a number of linked but distinct developments. Especially useful if, like me, you’re always looking for good material on finance and macroeconomics to use with undergraduates. Also from Mike Konczal: NY Fed Study Should Redefine How We Think About Student Loans and College Costs. There are two interesting points here, from my point of view. First, the fact that loans have a much stronger effect on college costs than Pell grants do, is yet another piece of evidence for the importance of liquidity; in a world without credit constraints, only the subsidy associated with federal student loan programs would affect anyone’s behavior. Second, it develops an argument I’ve been making for years — an important advantage of direct provision of public goods over vouchers and subsidies is that price movement will amplify effect of the former and reduce the effect of the latter.I should add that at CUNY, where I teach, the great majority of the students take on no debt at all, since Pell grants and New York’s Tuition Assistance Program both cover the full cost of tuition and fees. Over at Jacobin, my John Jay colleague Ian Seda-Irizarry has a useful overview of the Puerto Rican debt crisis. Related to the disgorge the cash and capital-reallocation topics we’ve been discussing here, Evan Soltas has an interesting post on What Ails the American Startup? He looks at census data that includes all firms, not just the publicly-traded corporations I’ve focused on, and finds the same long-term decline in the share of the economy accounted for by newer firms. My friend Will Boisvert, whose two posts on nuclear power remain the most widely-read things to ever appear on this blog, is now writing for the Breakthrough Institute. I’m not entirely down with the “ecomodernism” project, but Will is a very smart and careful writer and his stuff there is very worth reading. Here is my brother on CNBC, talking about the Kim Davis case. In a previous post, I pointed out that if capital means real investment, then the place where capital is going these days is fossil fuels, not the industries we usually think of as high tech. I want to build on that now by looking at some other financial flows across these same sectors. As I discussed in the previous post, any analysis of investment and profits has to deal with the problem of R&D, and IP-related spending in general. If we want to be consistent with the national accounts and, arguably, economic theory, we should add R&D to investment, and therefore also to cashflow from operations. (It’s obvious why you have to do this, right?) But if we want to be consistent with the accounting principles followed by individual businesses, we must treat R&D as a current expense. For many purposes, it doesn’t end up making a big difference, but sometimes it does. Below, I show the four major sources and uses of funds for three subsets of corporations. The flows are: cashflow from operations — that is, profits plus depreciation, plus R&D if that is counted in investment; profits; investment, possibly including R&D; and net borrowing. The universes are publicly traded corporations: first all of them; second the high tech sector, defined as in the previous post, and third fossil fuels, also as defined previously. Here I am using the broad measure of investment, including R&D, and the corresponding measure of cashflow from operations. At the end of the post, I show the same figures using the narrow measure of investment, and with profits as well as cashflow. For the corporate sector as a whole, we have the familiar story. Over the past twenty-five years annual shareholder payouts (dividends plus share repurchases) have approximately doubled, rising from around 3 percent of sales in the 1950s, 60s and 70s to around 6 percent today. 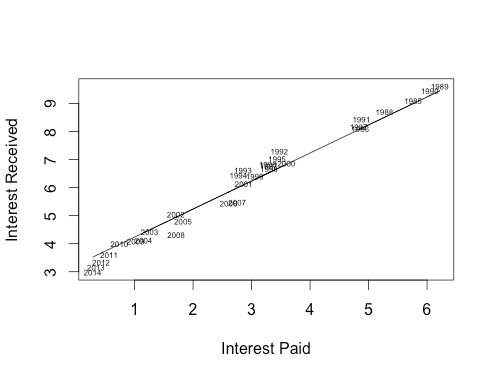 Payouts have also become more variable, with periods of high and low payouts corresponding with high and low borrowing. (This correlation between payouts and borrowing is also clearly visible across firms since the 1990s, but not previously, as discussed here.) There’s also a strong upward trend in cashflow from operations, especially in the last two expansions, rising from about 10 percent of sales in the 1970s to 15 percent today. Investment spending, however, shows no trend; since 1960, it’s stayed around 10 percent of sales. The result is an unprecedented gap between corporate earnings and and investment. Here’s one way of looking at this. Recall that, if these were the only cashflows into and out of the corporate sector, then cash from operations plus net borrowing (the two sources) would have to equal investment plus payouts (the two uses). In the real world, of course, there are other important flows, including mergers and acquisitions, net acquisition of financial assets, and foreign investment flows. But there’s still a sense in which the upper gap in the figure is the mirror image or complement of the lower gap. The excess of cash from operations over investment shows that corporate sector’s real activities are a net source of cash, while the excess of payouts over borrowing suggests that its financial activities are a net use of cash. Focusing on the relationship between cashflow and investment suggests a story with three periods rather than two. Between roughly 1950 and 1970, the corporate sector generated significantly more cash than it required for expansion, leaving a surplus to be paid out through the financial system in one form or another. (While payouts were low compared with today, borrowing was also quite low, leaving a substantial net flow to owners of financial assets.) Between 1970 and 1985 or so, the combination of higher investment and weaker cashflow meant that, in the aggregate all the funds generated within the corporate sector were being used there, with no net surplus available for financial claimants. This is the situation that provoked the “revolt of the rentiers.” Finally, from the 1990s and especially after 2000, we see the successful outcome of the revolt. This is obviously a simplified and speculative story. It’s important to look at what’s going on across firms and not just at aggregates. It’s also important to look at various flows I’ve ignored here; cashflow ideally should be gross, rather than net, of interest and taxes, and those two flows along with net foreign investment, net acquisition of financial assets, and cash M&A spending, should be explicitly included. But this is a start. Now, let’s see how things look in the tech sector. Compared with publicly-traded corporations as a whole, these are high-profit and high-invewtment industries. (At least when R&D is included in investment — without it, things look different.) It’s not surprising that high levels of these two flows would go together — firms with higher fixed costs will only be viable if they generate larger cashflows to cover them. But what stands out in this picture is how the trends in the corporate sector as a whole are even more visible in the tech industries. The gap between cashflow and investment is always positive here, and it grows dramatically larger after 1990. In 2014, cashflow from operations averaged 30 percent of sales in these industries, and reported profits averaged 12 percent of sales — more than double the figures for publicly traded corporations as a whole. So to an even greater extent than corporations in general, the tech industries have increasingly been net sources of funds to the financial system, not net users of funds from it. Payouts in the tech industries have also increased even faster than for publicly traded corporations in general. Before 1985, shareholder payouts in the tech industries averaged 3.5 percent of sales, very close to the average for all corporations. But over the past decade, tech payouts have averaged full 10 percent of annual sales, compared with just a bit over 5 percent for publicly-traded corporations as a whole. In 2014, there were 15 corporations listed on US stock markets with total shareholder payouts of $10 billion or more, as shown in the table below. Ten of the 15 were tech companies, by the definition used here. Computer hardware and software are often held out as industries in which US capitalism, with its garish inequality and fierce protections of property rights, is especially successful at fostering innovation. So it’s striking that the leading firms in these industries are not recipients of funds from financial markets, but instead pay the biggest tributes to the lords of finance. 2014. Values in millions of dollars. Tech firms in bold. It’s hard to argue that Apple and Merck represent mature industries without significant growth prospects. And note that, apart from GE (which is not listed in the the high-tech sector as defined here, but perhaps should be), all the other members of the $10 billion club are in the fast-growing oil industry. It’s hard to shake the feeling that what distinguishes high-payout corporations is not the absence of investment opportunities, but rather the presence of large monopoly rents. Finally, let’s quickly look at the fossil-fuel industries. Up through the 1980s, the picture here is not too different from publicly-traded corporations in general, though with more variability — the collapse in fossil-fuel earnings and dividends in the 1970s is especially striking. But it’s interesting that, despite very high payouts in several big oil companies, there has been no increase in payouts for the sector in general. And in the most recent oil and gas boom, new investment has been running ahead of internal cashflow, making the sector a net recipient of funds from financial markets. (This trend seems to have intensified recently, as falling profits in the sector have not (yet) been accompanied with falling investment.) So the capital-reallocation story has some prima facie plausibility as applied to the oil and gas boom. In the next, and final, post in this series, I’ll try to explain why I don’t think it makes sense to think of shareholder payouts as a form of capital reallocation. My argument has two parts. First, I think these claims often rest on an implicit loanable-funds framework that is logically flawed. There is not a fixed stock of savings available for investment; rather, changes in investment result in changes in income that necessarily produce the required (dis)saving. So if payouts in one company boost investment in another, it cannot be by releasing real resources, but only by relieving liquidity constraints. And that’s the second part of my argument: While it is possible for higher payouts to result in greater liquidity, it is hard to see any plausible liquidity channel by which more than a small fraction of today’s payouts could be translated into higher investment elsewhere. Finally, here are the same graphs as above but with investment counted as it is businesses’ own financial statements, with R&D spending counted as current costs. 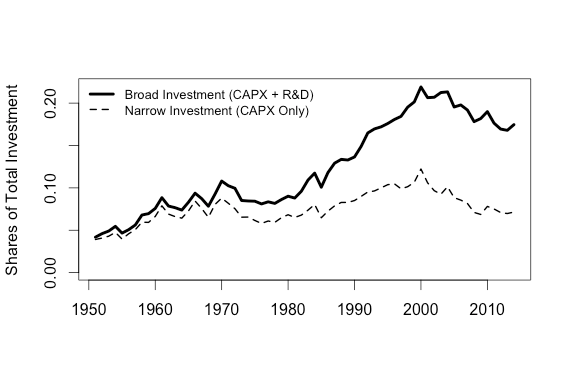 The most notable difference is the strong downward trend in tech-sector investment when R&D is excluded. Is Capital Being Reallocated to High-Tech Industries? Readers of this blog are familiar with the “short-termism” position: Because of the rise in shareholder power, the marginal use of funds for many corporations is no longer fixed investment, but increased payouts in the form of dividends and sharebuybacks. We’re already seeing some backlash against this view; I expect we’ll be seeing lots more. The claim on the other side is that increased payouts from established corporations are nothing to worry about, because they increase the funds available to newer firms and sectors. We are trying to explore the evidence on this empirically. 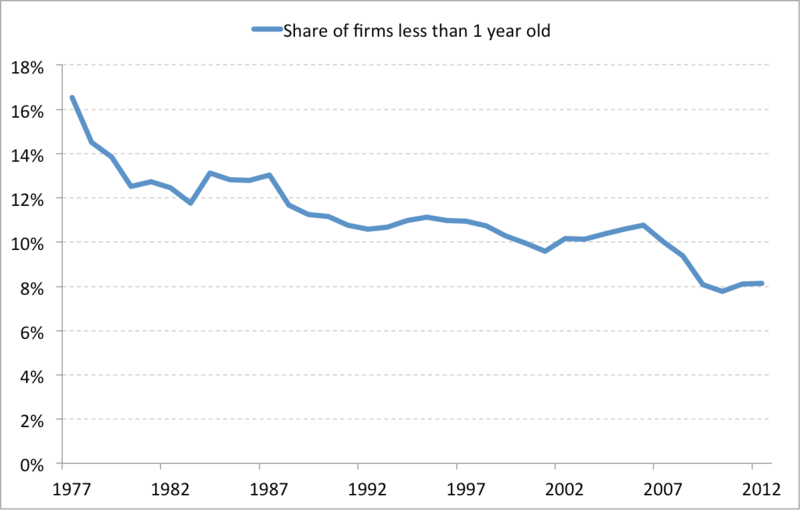 In a previous post, I asked if the shareholder revolution had been followed by an increase in the share of smaller, newer firms. I concluded that it didn’t look like it. Now, in this post and the following one, we’ll look at things by industry. In that earlier post, I focused on publicly traded corporations. I know some people don’t like this — new companies, after all, aren’t going to be publicly traded. Of course in an ideal world we would not limit this kind of analysis to public traded firms. But for the moment, this is where the data is; by their nature, publicly traded corporations are much more transparent than other kinds of businesses, so for a lot of questions that’s where you have to go. (Maybe one day I’ll get funding to purchase access to firm-level financial data for nontraded firms; but even then I doubt it would be possible to do the sort of historical analysis I’m interested in.) Anyway, it seems unlikely that the behavior of privately held corporations is radically different from publicly traded one; I have a hard time imagining a set of institutions that reliably channel funds to smaller, newer firms but stop working entirely as soon as they are listed on a stock market. And I’m getting a bit impatient with people who seem to use the possibility that things might look totally different in the part of the economy that’s hard to see, as an excuse for ignoring what’s happening in the parts we do see. Besides, the magnitudes don’t work. Publicly traded corporations continue to account for the bulk of economic activity in the US. For example, we can compare the total assets of the nonfinancial corporate sector, including closely held corporations, with the total assets of publicly traded firms listed in the Compustat database. Over the past decade, the latter number is consistently around 90 percent of the former. Other comparisons will give somewhat different values, but no matter how you measure, the majority of corporations in the US are going to be publicly traded. Anyway, for better or worse, I’m again looking at publicly-traded firms here. In the simplest version of the capital-reallocation story, payouts from old, declining industries are, thanks to the magic of the capital markets, used to fund investment in new, technology-intensive industries. So the obvious question is, has there in fact been a shift in investment from the old smokestack industries to the newer high-tech ones? As you can see, R&D spending is very important for these industries; for the past 20 years, it has consistently exceed investment spending as traditionally defined. 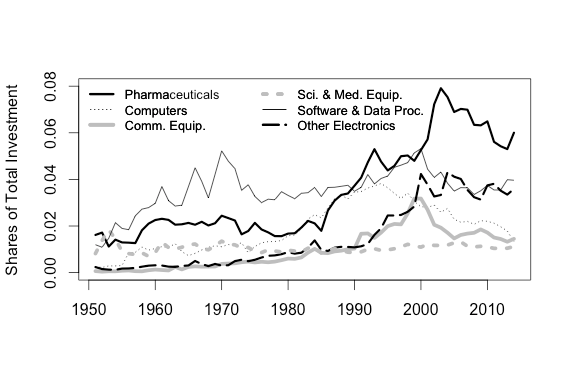 Using the older, narrow definition, these industries account for no greater share of investment in the US than they did 50 years ago; with R&D included, their share of total investment has more than doubled. But both measures show the high-tech share of investment peaking in the late 1990s; for the past 15 years, it has steadily declined. Obviously, this doesn’t tell us anything about why investment has stalled in these industries since the end of the tech boom. But it does at least suggest some problems with a simple story in which financial markets reallocate capital from old industries to newer ones. The next figure breaks out the industries within the high-tech group. Here we’re looking at the broad measure of investment, which incudes R&D. As you can see, the decline in high-tech investment is consistent across the high-tech sectors. While the exact timing varies, in the 1980s and 1990s all of these sectors saw a rising share of investment; in the past 15 years, none have. So we can safely say: In the universe of publicly traded corporations, the sectors we think would benefit from reallocation of capital were indeed investing heavily in the decades before 2000; but since then, they have not been. The decline in investment spending in the pharmaceutical industry — which, again, includes R&D spending on new drugs — is especially striking. The red lines show broad and narrow investment for oil and gas and related industries — SICs 101-138, 291-299, and 492. Either way you measure investment, the increase over the past 15 years has dwarfed that in any other industry. 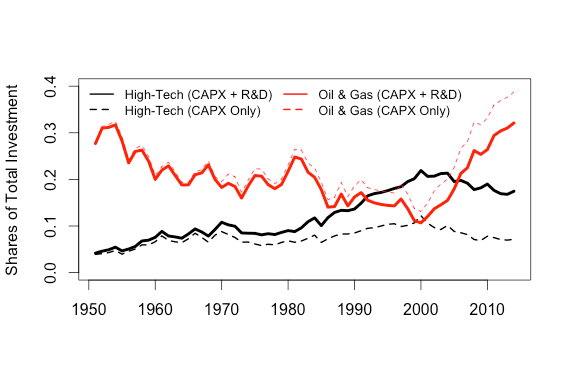 Note that oil and gas, unlike the high-tech industries, is less R&D-intensive than the corporate sector as a whole. Looking only at plant and equipment, fossil fuels account for 40 percent of total corporate investment; by this measure, in some recent years, investment here has exceeded that of all manufacturing together. 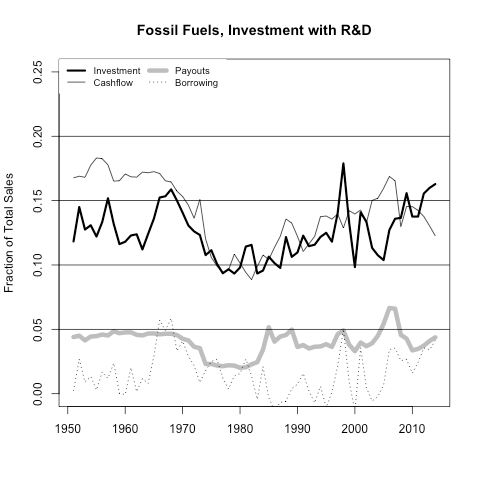 With R&D included, by contrast, fossil fuels account for “only” a third of US investment. Very few of the people talking about the dynamic way American financial markets reallocate capital have, I suspect, a clear idea of the actual reallocation that is taking place. Save for another time the question of whether this huge growth in fossil fuel extraction is a good thing for the United States or the world. (Spoiler: It’s very bad.) I think it’s hard to argue with a straight face that shareholder payouts at Apple or GE are what’s funding fracking in North Dakota. This seems to be part of a larger phenomenon of the official statistical agencies being pulled into the orbit of economic theory and away from business accounting practices. It seems to me that allowing the official statistics to drift away from the statistics actually used by households and businesses creates all kinds of problems. Specifically, it is SICs 83, 357, 366, 367, 382, 384, and 737. I took this specific definition from Brown, Fazzari and Petersen. It seems to be standard in the literature. Since you are probably wondering: About two-thirds of that spike in software investment around 1970 is IBM, with Xerox and Unisys accounting for most of the rest. Posted on September 1, 2015 September 7, 2015 Tags Compustat, disgorge the cash, finance, investment, macroeconomic history, payouts as reallocation, the money view, the problem of the 21st century is the problem of climate change9 Comments on Is Capital Being Reallocated to High-Tech Industries?